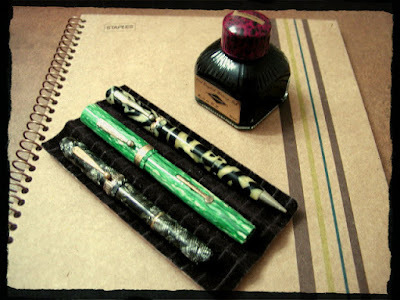 A photo of three obscure fountain pen brands, all made by J. Harris & Co., which eventually became the Majestic Pen Company (from bottom: Congress, Ambassador & Majestic fountain pens). The Majestic is a fountain pen/mechanical pencil combo. The ink is Diamine Turquoise, which I got in the Ink Swap (thanks, Charles!). I made a list of the brands that our members brought in for our theme of "Obscure Fountain Pen Brands": Salz, Tombow, Recife, Kaweco, Wancher, CONID, Diamond Point, Celtic Pen, Centropen, Rexpen, Padrino, X-Pen, Marxton, Ottawa, Eagle, Epenco, Majestic, Congress, Ambassador, Stratford, Kolber, American, Eberhard-Faber, Arnold, Jefferson, Waterson, DuBarry, Biltwel, Empire, Ever Ready, Adria Gold, Bankers Pen, Phoenix, Remington, Rex and Superman.